Cat Chat With Caren And Cody: A Kitty Toy Paradise!! 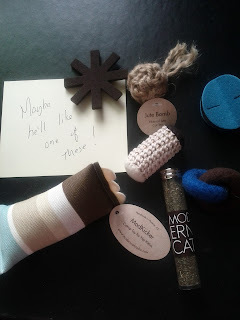 Compliments of The Moderncat Studio Etsy Shop "treats and toys for stylish felines"
A Kitty Toy Paradise!! Compliments of The Moderncat Studio Etsy Shop "treats and toys for stylish felines"
Today is "Thankful Thursday" and I have to send a HUGE THANK YOU to Kate Benjamin of Moderncat and the Moderncat Studio Etsy Shop! 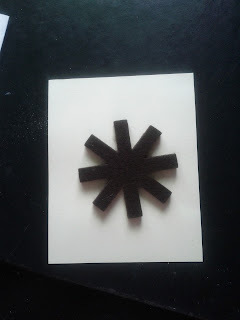 A few weeks ago I received the most catabulous box of goodies from Kate, I just couldn't believe my eyes! Mom is captivated by the color/quality of all of the toys and the fact that they are made out of materials that aren't harmful to me. I love them because I can swat 'em, chase 'em, carry 'em, put the bitey on 'em, bunny kick 'em and just have a catabulous time with 'em! Look at all of these great toys! 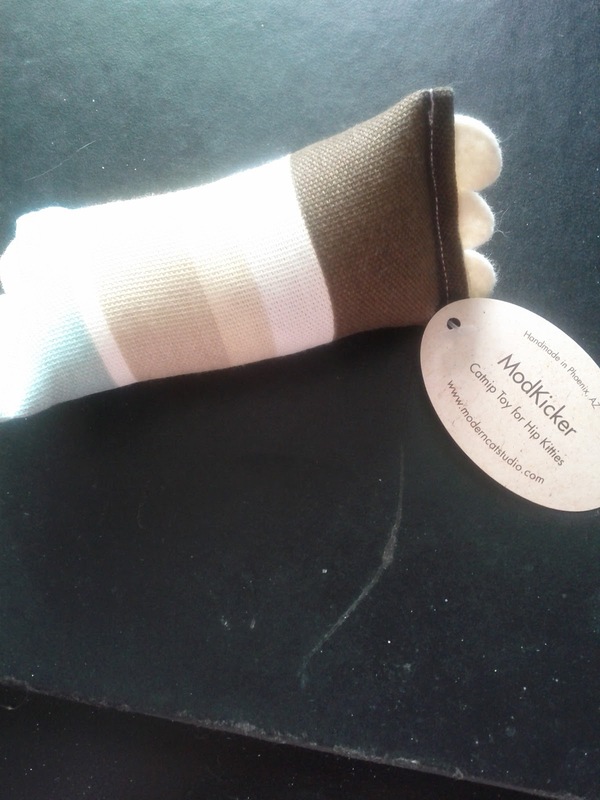 "ModKickers are a must-have in any moderncat household. These designer toys are a favorite with the felines. Perfect for bunny kicking, attacking, and snuggling, these cat toys are stuffed with organic catnip and polyfill for extra kick. Made with sturdy designer fabrics in mod patterns and colors, you won't mind seeing these scattered around your house. 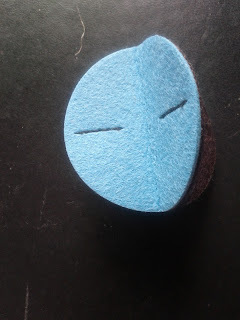 This listing is for one small ModKicker measuring approximately 2.5" x 4.5" in aqua, chocolate, and cream striped fabric with cream felt trim." and makes a get-away with it!
" 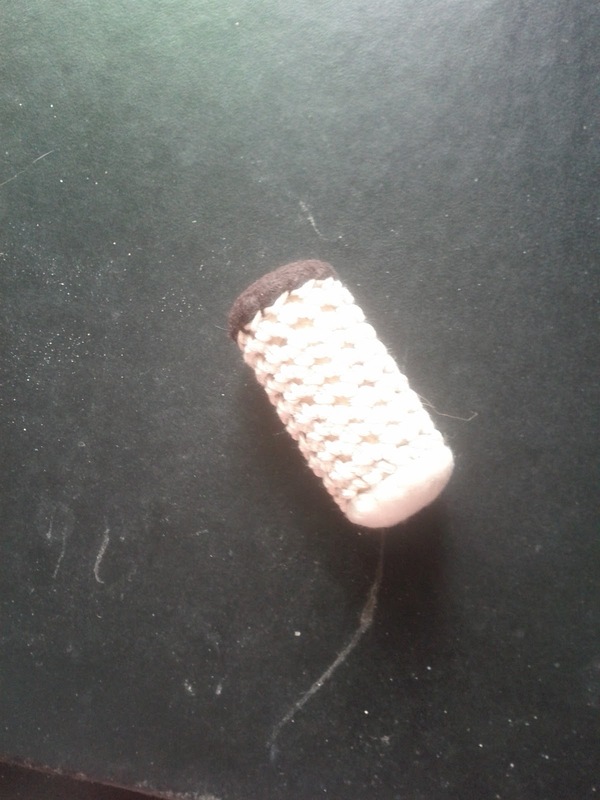 Bamboleos (Spanish for rock, roll, and wobble) turn recycled wine corks into stylish little toys that cats love. Each one is handmade using natural cork, sturdy cotton twine, and felt endcaps stuffed with fine-grind organic catnip. Babmoleos are the perfect size for chasing and carrying"
Designed and made by Gerda Lobo exclusively for Moderncat Studio. Wait til you see me grab this! MOL! "Only for the coolest cats, these hip little toys will be a new favorite! Cut from thick 100% Merino wool, in vibrant non-toxic retro colors, each toy is the perfect size and shape for zipping across the floor. 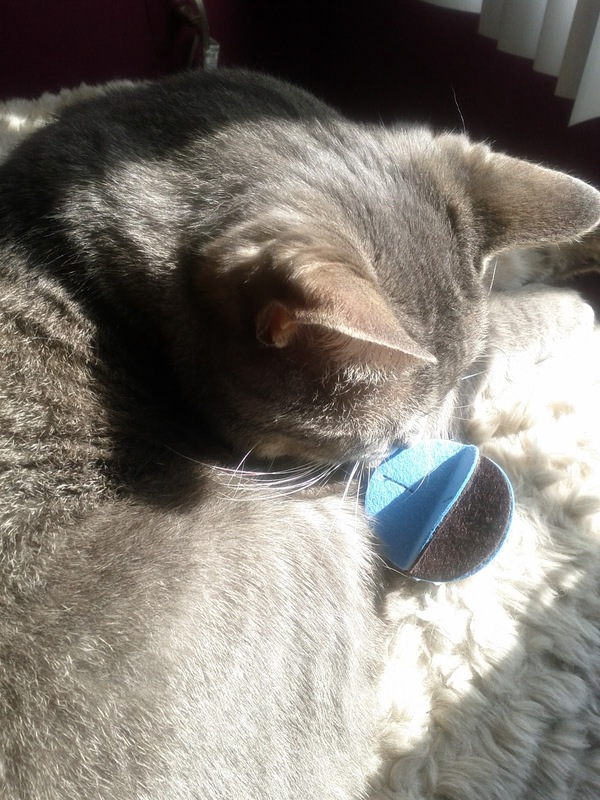 Merino wool is an eco-friendly, all natural, renewable material that appeals to cats"
Designed and made by Kate Benjamin. 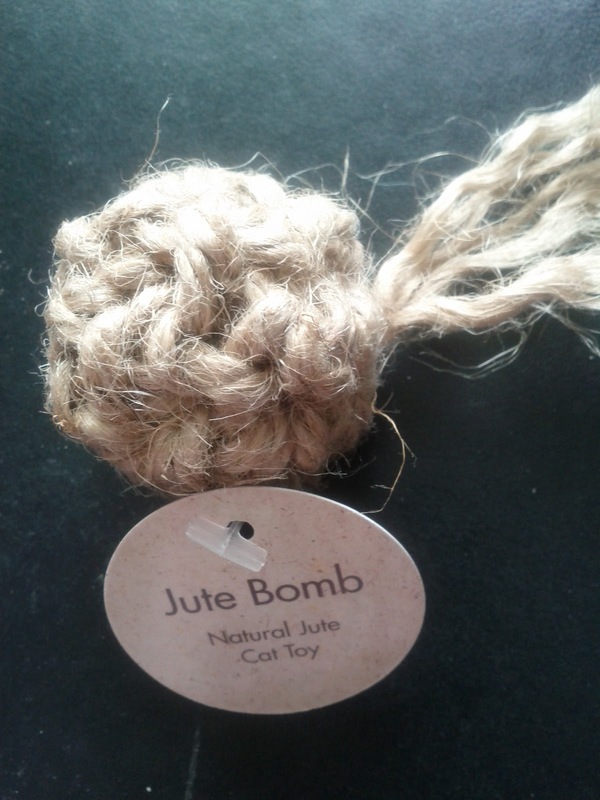 "If your kitty prefers a little jingle with his jostle, then our new Jingle Jute Bombs are just for him! We took our popular Jute Bomb and added a little silver bell inside so when kitty shoots this toy across the floor it's extra fun. Just like our regular Jute Bombs, these little textured treats will have kitty leaping and pouncing all over the place. The kitty-sized spheres are the perfect size for tossing and carrying around." 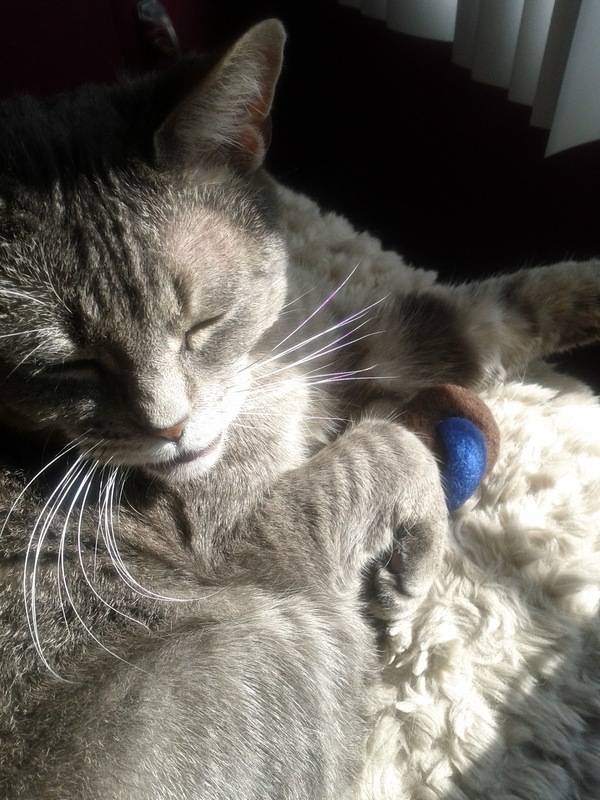 "Lynks felted wool cat toys are a favorite with finicky felines. Crocheted from 100% Peruvian Highland wool and felted several times to get the perfect texture that kitties love. The ideal size and shape for carrying and batting around, we guarantee that these toys will mysteriously appear in different places every time you turn your head. Choose from a variety of rich color combos. The best thing about these cat toys: they don't hurt when you step on them in the middle of the night!" Machine washable in cold water, tumble dry. "Perfect for chasing, pouncing, and flinging, these hip little kitty toys will please both you and your cat. Made simply with sewn felt, each sphere measures 2 inches in diameter and comes in a cool two-tone color combo." Designed and handmade by Kate Benjamin. that is going to take a nap with me? with me to take a nap too! Please be sure to visit the Moderncat Studio Etsy Shop. Each month a different cat related charity is selected to receive 5% of the total sales for that month. That's kitty toys for a good cause! Thank you Kate for allowing Mom and I to have such a fun playtime together!! Dakota was at the groomer so we had the living room all to ourselves to enjoy Kate's toys! You can see that I loved these toys and now that the camera isn't "rolling" I can play with them with complete and total abandon! We were not compensated for this review. We received toys from Moderncat Studio Etsy Shop to test/review. Wow Cody! You really went nuts over those toys! And I don't blame you - we have a selection of Moderncat toys and we love them too! Whoa! Cody, you must be in kitty toy haven! purrr....meow! @Sparkle aren't they just the BEST!? The colors are just wonderful too and Mama loves how safe they are for kitties! @Cat from Sydney yes I am!!! Great review. I love all the pictures so I can see the products in action. Thanks for the heads up on all that new stuff. Good review Cody. There are a couple of things there that I told M like like to have. (hint hint M!) Maybe for Christmas! Great toys and it was nice to see Cody enjoying them!!! I absolutely love Etsy and am on the site all the time! You can find anything there, it is an amazing collection of artisans and creative things!!! Those look like terrific toys. Cody you sure did a great job showing us how much fun they are to play with. Have a great day. Wow! you've a huge toy collection, Cody. Those toys look so interesting and fun. I'd go crazy if I got a chance to play with them. I hear that Dakota was at the groomer, hope he was safe and sound. Guess he smells like flowers and perfume now, LOL! @mario thank you! I should have put prices on this, they are super reasonably priced! I bet Santa will bring them for you because you are such a good kitty! @Marg thanks so much! Mom said yesterday I have to "earn my keep"...my case of Royal Canin Rabbit from the vet was over $50!! Mom wasn't happy MOL! @Cat I couldn't agree more! They have wonderful items there! I could stay there all day! These are the best made cat toys I've seen anywhere. Ruby and Allegra go nuts for the Bamboleo and the Lynks, and they're having fun training me to retrieve the Atomic Flyer from underneath furniture after they've shoved it under there! Those toys look fun and different. Re your comment about Jack: I also read on the facebook page about the vet saying he had a 50/50 chance. However the person posting on facebook felt the vet was being cautious and believed his chance was better than that. Can't imagine what it was like for him for 2 months. What a miracle he is even alive at all. We will purr hard for him to pull through. Wow Cody you had some great toys to try out. My cats are more casual than stylish. But they said that they would love and play with any new toys. @Two French Bulldogs yes I know! I am a lucky kitty! @Hannah and Lucy wish you could come over and play with me! @Simba I soooo pray he pulls through! I think with everyone purring and praying, he will! @Ingrid lmao at Ruby and Allegra training you! I think Cody took their class because he swats everything in the most hard-to-reach places! I agree with you about these being the best made toys anywhere. 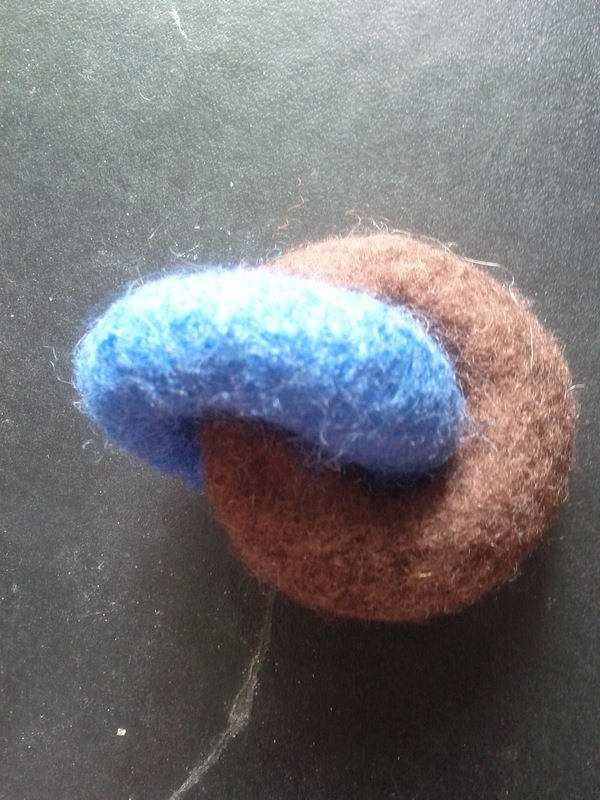 I am super particular about cat toys and these are superb. BTW THANK YOU again for posting those springs on your blog, Cody ADORES them! I am so purring for Jack. Thank Heaven he was found at last gnat poor baby! I hope the airline is paying for his care!! That is one amazing haul of fun stuff! Looks like you had a fun time with the new toys, those are great! I want an Atomic Flyer for Christmas! Meanwhile, happy Halloween to you both! Wow!! Cody!!! You've hit the jackpot with all these amazing toys!! Me and Charlie love how you give them all your full concentration!! Yay!!! Cody, you are the best and luckiest toy tester ever! We like all things natural, so these would be a hit with us. Aw, we LOVE all of the videos of Cody in action! Some a handsome man cat. @Maggie Mae I am so lucky and yep these are great toys! @Layla thank you sooo much! Mom liked these too for the same reason. Nice and safe, no plastic thingies, beautifully made, you would love them! @Old Kitty, My Mom liked your comment so much because she says that ever since I was a kitten I focused on and stared at EVERYTHING and I still do! xoxoxo to you and Charlie! @Quasi hope Santa brings you one! Happy Halloween to you too! @Stacy and Ellie thank you we loved them! @Brian thank you! I was thrilled! @Weetzie thank you soooo much! Mom liked the video (the last one) where I drop the toy and don't even bother to pick it up. MOL! @Admiral Hestorb hell YES the airline had better be paying for Jack's care! I also pray he pulls through this. What a tough kitty! Those are some wonderful toys you got to play with. We love the videos of you playing. I love to play, but as soon as Mom picks up a toy to play with me (except for the wand toys) I refuse to play with it again, and Cody will only play with Mom under the cover of hiding behind the couch. these toys are so lovely! 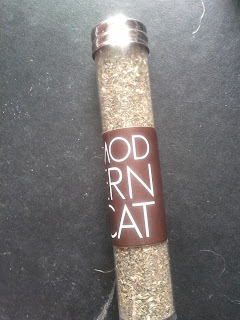 Love ModernCat, the Jute Toy looks like a must have! MeWowZa...People say us CRex are energetic, but you and those toys top our enthusiasm big time! You are a great spokescat for those toys! I got some Kate's toys before and weee love them too! they are the bestest!!! Those look like great toys! Holy Moly, Cody! You hit the jackpot on theese one! No wonder you needed a nap! We enjoyed seeing all those incredible toys and your demonstrations of them. They are really high quality and creative toys that's for sure. @Clooney yep they are high quality and creative! I am STILL tired from playing! MOL! @Goma yes they are! Mom & I love them! @Teri awwww that was soooo sweet of you! I am rarely energetic! I am a lazy boy! @Abi yes they are!! We love Kate!